Flamboyan works beyond Washington, DC through the National Family Engagement Fellowship, through which we build the capacity of change makers leading the charge for effective, family engagement in their communities. 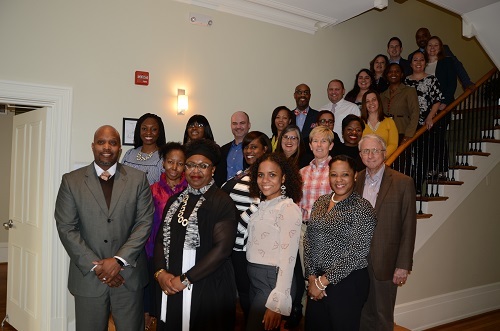 During the 20-month fellowship, Fellowship Teams – groups of four to five family engagement leaders and advocates – design a family engagement strategic plan to implement in their local school community. National Fellows build expertise, learn with and from each other, and join a growing network of family engagement advocates across the country. January 2018 marked the beginning of cohort 2 of the Fellowship. We welcomed Fellowship Teams from Atlanta, Dallas, Memphis, Utah, and Milwaukee. The fellowship is designed to build participants’ knowledge of effective family engagement exposing Fellows to expert practionioners and researchers and teaching them strategic planning and an equity-focused program design. Fellows conduct a landscape assessment to crystallize their understanding of the family engagement related challenges and opportunities within their community. Based on their landscape assessment, fellows will design and implement short-cycle projects and pilots. Using the knowledge and capacity gained from the short-cycle projects and pilots, fellows develop a one to three-year strategic plan for implementation and continuous improvement of family engagement, with an eye toward balancing a bottom-up and top-down approach. Fellows actively participate in a learning community–sharing best practices and informing their own practice in effective family engagement. The in-person convenings have been so impactful. I enjoyed getting to know Fellows from other locations, understanding their unqiue challenges and barriers. It helped me to reflect on my own work. In particular, I appreciated the boldness in which conversations on race and equity were approached. They greatly benefit my team, as a whole and each of us as individuals. It is work that we are now taking back to Kansas City. The application for the current cohort has closed. If you are interested in applying for a future cohort, join our National Family Engagement Fellowship recruitment news alert below.